Wally Hayes - Since 1986, Wally has worked as a photographer under contract to Nova Scotia Tourism, Culture and Heritage. Each year, he travels upwards of 20,000 kilometers and shoots 10 to 15 thousand new images. In 23 years with Tourism, there are not too many roads in Nova Scotia that he has not been up and down at least a dozen times and he always finds something new to photograph. Wally’s photos are featured in Nova Scotia Tourism campaigns throughout the world. Also, check out photos on his blog at novascotiablogs.com. Wally is known for his inspiring audio-visual presentations and will bring along several to perhaps inspire you in your photographic pursuits. Sherbrooke Village will be hosting a 4-day photography workshop. 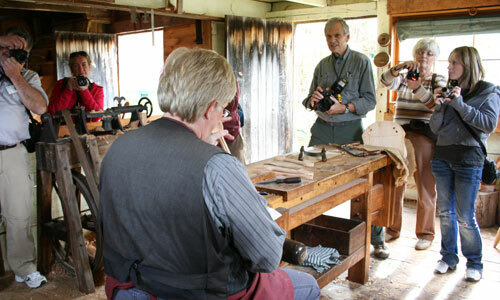 The village offers a wealth of material for pictures and has inspired Wally for many years. There could be no more beautiful setting for this learning experience than the shores of the St. Mary’s River and the Historic Sherbrooke Village site with its wealth of colour and architecture. There will be a classroom available in the event of inclement weather. Wally will instruct and guide students in the basic to intermediate aspects of digital photography including exposure, lighting, composition, flash and digital image editing and management. Our courses are built for everyone, from the novice to the more experienced, perfect for those wanting to know more about the art and science of digital photography. Each evening the class will get together for a short critique, conversation and nighttime photography. Anyone interested in photography should have this solid foundation. It is essential that you are aware of these important fundamentals if you would like to improve your abilities. Orientation will begin Thursday afternoon at 1:00 pm at 10:00 am at the Sherbrooke Village Exhibit Centre (building #22) for introductions and a short description about Historic Sherbrooke Village. We will hold an exhibition of the week’s works on Sunday from 11:30 to 12:30 pm which will round off our week. The atmosphere at our school is casual and there will be the opportunity for individual expression in your photography. There is easy access to wooded trails and the beautiful St. Mary’s River is on the camp property. The climate can vary from warm and sunny to chilly cloudy and wet so be prepared to layer with sweaters and pants. Timetable, schedule and session information will be distributed when you arrive. Accommodations for students will be in our Hands on History home which is a hostel type house by the river - accommodations are dorm style with shared rooms and bunk style beds, please be advised to bring your own sleeping bags, towels, toiletries and pillow. You may also bring air mattresses for additional comfort. Meals are included for Monday lunch to Thursday lunch. We have some great cooks here, who have been feeding groups, school kids and teachers for years. Meals will be served at the Sherbrooke Village Tea Room. All meals are home style country fare. Diabetic, vegetarian and any diet that allows you to eat from the meals provided can be accommodated at our restaurant. All other special diet requirements must be looked after by the individual. Refrigerator & kitchen facilities available at lodging building to store & prep your own food. All refreshment breaks will be served at the Exhibit Centre (building #22). When you register please indicate on the registration form in the space provided your level of experience, novice, intermediate or advanced; also a brief description of your camera type, ie film or digital, SLR or Point & Shoot. You may stay over on Thursday, to have a fresh start on your journeys Friday morning. Thank you all for coming and please come again.